Hillcrest Care Center (now Hillcrest Health & Rehab) has been providing quality care for aging adults in the Bellevue area since 1967. It was acquired by Jolene Roberts in 1989, whose vision was to go beyond one nursing facility and create a full continuum of health services for aging adults, providing a seamless transition to the services needed without compromising continuity of care. This innovative concept allowed Hillcrest to become one of the Omaha area’s most progressive retirement communities, offering upscale senior living and outstanding senior care services. Today, Ms. Roberts serves as President and Chief Development Officer of Hillcrest Health Services, featuring 1,250 team members, who are enhancing the lives of more than 1,200 aging adults every day. Under her guidance, Hillcrest’s Executive Team is leading the organization toward becoming a national leader in aging services, including skilled nursing, post-acute rehabilitation, outpatient therapy, wellness, independent living, assisted living, memory support, home care, in-home personal care, telehealth and hospice. Ms. Roberts led the construction and development of Mable Rose Estates, now Hillcrest Mable Rose, an assisted living and memory support residence on Hilltop Drive in Bellevue, close to the Papillion border. The residence also offers Sarpy County’s only adult day services program, The Club, on weekdays. Hillcrest Victoria Gardens opened as an assisted living residence adjacent to Hillcrest Health & Rehab, but eventually was converted to a secure memory support residence to meet the growing demand of the memory-impaired population in Bellevue. It was then converted to the long-term care neighborhood of Hillcrest Health & Rehab Magnolia in 2016. Today, a maximum of 32 residents with Alzheimer’s or other dementia conditions enjoy the safety and tight-knit camaraderie of two secure, loving households. Hillcrest began the development of Home Care and Hospice. In 2007, Hillcrest Home Care became CMS-certified as a skilled home health provider, meeting the short-term needs of homebound adults who are recovering from illness, surgery or a stay in a hospital or post-acute facility. Later, Hillcrest Home Care added in-home personal care services to meet the care and companionship needs of aging adults at home. Hillcrest Country Estates opened in Papillion, featuring some of the nation’s first freestanding nursing cottages. The “culture change” philosophy first taught by the Pioneer Network in the mid 1990’s had been refined and adapted by the Hillcrest team to provide true resident-directed care in 8 private houses, each hosting up to 13 elders. The Cottages, which earned a 5-star rating by CMS in 2012, serve as the gold standard for high-quality nursing care in the Midwest. The first Signature Villas were opened in 2009, featuring beautiful single family and duplex homes for those 55 and better. Currently 31 Villas surround a beautiful fish-stocked pond with a fountain and a picturesque 20-foot waterfall. A limited number of lots still remain for new construction. Hillcrest Hospice Care was certified and introduced as a compassionate, innovative leader in end-of-life support services for eastern Nebraska. Hillcrest Health & Rehab (HHR) became the region’s only dedicated post-hospital rehab facility, dedicated to serving up to 114 short-term guests who are recovering from illness, injury or surgery. Since 2016, Hillcrest Health & Rehab Magnolia offers long-term care services in a separate, dedicated neighborhood, while five neighborhoods remain exclusively post-acute. Renovations at Hillcrest Health & Rehab introduced the 1702 Bistro and the first made-to-order dining program in the region. Hillcrest Physical Therapy (HPT)- the region’s only outpatient therapy clinic focused on aging adults – had operated within Hillcrest Health & Rehab’s 10,000 square foot therapy gym. With HHR becoming full dedicated to rehab guests, and the continued growth of HPT, Hillcrest recognized the opportunity to move outpatient therapy to a dedicated building across the parking lot from HHR. In 2012, HPT re-opened at 1804 Hillcrest Drive, offering patients a dedicated 5,000-square foot gym with new equipment, a walking track, private massage room and one of the region’s only hand-therapy suites. Construction began on the Grand Lodge at Hillcrest Country Estates (HCE), which features 102 independent living apartments, 30 assisted living and 30 memory support apartment, plus an indoor saltwater pool and hot tub, fitness center, restaurant, bistro, pub, cinema, performing arts center, hobby and woodworking shops, library and day spa. The Grand Lodge opened in 2015 at the corner of 60th Street and Highway 370 in Papillion, just one mile from Shadow Lake Towne Center. President and CEO, Jolene Roberts, was inducted into the Sarpy County Business Hall of Fame. Construction on The Grand Lodge at Hillcrest Country Estates continues and has more than 75% of the independent apartments reserved with an expected opening date in spring 2015. Another addition to Hillcrest Country Estates, The Rehab Cottage, is under construction and scheduled to open in summer 2015. The Rehab Cottage will offer 22 accommodations for short-term, post-acute care in a household setting. Hillcrest Health Services was named Business of the Year, 26+ Employees, by the Sarpy County Chamber of Commerce. 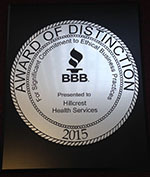 Hillcrest Health Services received the BBB Integrity Award. Hillcrest Home Care also expanded to Dodge County, serving the greater Fremont area and bringing the number to nine counties served. The Rehab Cottage opened. In December of 2015, the Grand Lodge officially opened and full occupancy in independent living would be reached in just seven months. Huntington Park Care Center joined the Hillcrest family of services, renamed as Hillcrest Shadow Lake. Also in 2016, Hillcrest Hospice Care eclipsed the 100 patient mark, becoming the largest provider of hospice services in the area. Hillcrest Health Services also announced the planned construction of Hillcrest Firethorn in Lincoln and Hillcrest Millard in Omaha. Both facilities will be solely focused on transitional care, also known as post-acute rehab. Ms. Roberts was named Sarpy County Chamber of Commerce’s Business Person of the Year. Our amazing team ensures the best in innovative senior health services throughout our senior living communities and health care centers. Click the link below to learn about our executive team and administrators who help make it all possible.